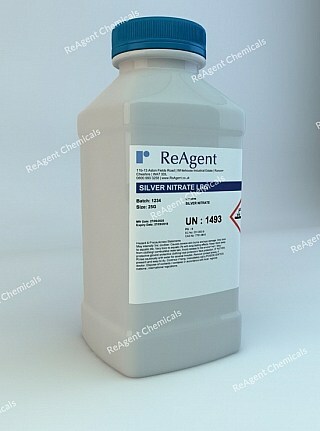 Why should you Buy Silver Nitrate from ReAgent? With the molecular formula AgNO3, silver nitrate is an inorganic compound in the form of odourless white crystals. Historically, it was once called lunar caustic as ancient alchemists believed silver was related to the moon. A common reaction, known to many students around the world, involves suspending a copper rod in a silver nitrate solution. After a few hours, the solution is turned blue as the silver nitrate reacts with copper to generate silver metal crystals leaving copper nitrate (blue) in solution. Another well-known reaction involves decomposition of silver nitrate at high temperatures. This reaction becomes particularly prevalent as the temperature approaches its melting point (250 degree Celsius) and will totally decompose at temperatures above 400 degree Celsius. 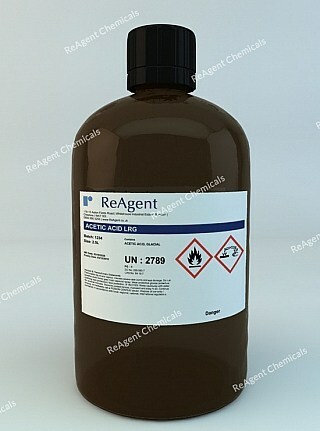 Interestingly, this reaction produces elemental silver (Ag) instead of silver oxide, as it would be expected from the decomposition of metal nitrates. How is Silver Nitrate Made? ReAgent has been an established chemical manufacturer for over 30 years and during that period, we’ve built an enviable reputation for high-quality products and excellent customer service. If you need assistance, a member of staff will be glad to help before, during and after your order. Contact us for further information or free technical advice. 1542 H314 Causes severe skin burns and eye damage. 1542 H290 May be corrosive to metals. 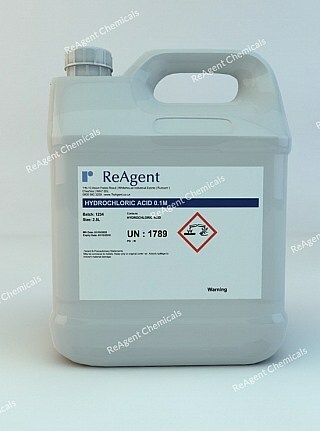 1542 H410 Very toxic to aquatic life with long lasting effects. 1542 H272 May intensify fire; oxidiser. 1542 P280 Wear protective gloves/ protective clothing/ eye protection/ face protection. 1542 P303+P361+P353 IF ON SKIN (or hair): Take off immediately all contaminated clothing. Rinse skin with water/ shower. 1542 P305+P351+P338 IF IN EYES: Rinse cautiously with water for several minutes. Remove contact lenses, if present and easy to do. Continue rinsing. 1542 P501 Dispose of contents/ container in accordance with local regulations. 1542 P273 Avoid release to the environment. 1542 P220 Keep away from combustible materials. As a leading UK manufacturer of silver nitrate for over 40 years, ReAgent is able to handle all orders of silver nitrate no matter how large or small. We supply silver nitrate in a variety of grades and solutions, produced by dissolving silver in nitric acid to a specified concentration. We are a quality assured company working to stringent ISO 9001 Quality Management System requirements at all times. This ensures full traceability on all our products and orders. We also retain accreditation to the ISO 14000 Environmental Standard, a sign of our proud commitment to the environment. To prepare certain silver-based explosives such as silver fulminate, azide or acetylide. Silver nitrate in its purest form is hazardous, corrosive and dangerous for the environment. It will also stain the skin by darkening it. It is crucially important that this product is handled responsibly by qualified persons wearing appropriate Personal Protective Equipment (PPE). This includes gloves, eye protection, protective clothing and safety boots or shoes. In a diluted solution silver nitrate does not warrant any hazardous warning symbols. However, this chemical should still be treated with care. Whether purchasing silver nitrate in solid or solution form, customers should consult the relevant Material Safety Data Sheets (MSDS) for handling and storage information. These are available to download from this page.